Island Jerolim is the closest island, directly opposite to Hvar town, named after a now-disappeared 15th century church. It is a favorite island among tourists who stroll away from the main jetty and stretch out on one of the shady coves. The famous and traditional Hvar’s nudist swimming area is situated on the Jerolim isle. There are showers and a restaurant. The swimming area can be accessed by the organized, regular boat connection from the port of Hvar. A woody lagoon with a number of pebble beaches, numerous hidden places for relaxation and picturesque submarine life. There are several restaurants. The swimming area can be accessed by the organized, regular boat connection from the port of Hvar. Sveti Klement is the largest Pakleni island (called Veliki Otok or Big Island) famous for beautiful Palmizana hamlet, the oldest and most famous Hvar’s resort and the nautical marina. When a professor Eugen Meneghello built a summer house and inns on Palmižana in the 20th century it became a favorite getaway for Hvar islanders. Now this house is a small museum and a gallery. Palmižana (Vingradišće lagoon precisely) is a spacious lagoon with shallow and sandy beach. It is surrounded by the thick, pine forest, fragrant heather and rosemary bushes and various, exotic plants. Scuba divers love Palmizana due to its vibrant underwater life. There are several restaurants and B&Bs. Palmižana can be accessed by the organized, regular boat connection from the port of Hvar. A traditional small fishing village, local’s resort on Pakleni Otoci. Once a roman villa, later a village dedicated to St. Clement. 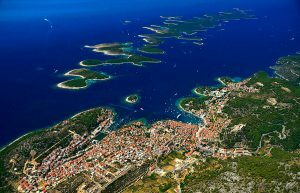 Today it is a destination to everyone who wishes to spend holidays on Hvar, in a direct contact with nature and locals. If you wish to experience plebeian festivity, visit Vlaka on St. Clement’s day, celebrated on the last Sunday in July. There are several restaurants. Vlaka can be accessed by own or hired boat.